Clients at Achieve Australia’s three New South Wales locations in Epping, Seven Hills and Casino are benefitting from recently installed sensory rooms. The new sensory wall display units boast vivid imagery, sound and light projections and detect touch gestures, similar to those used on smartphones and tablets. Regional Manager at Achieve Australia in Casino, Karen Moore-Evans says from the moment the system was turned on participants were very excited about using the new technology. The technology also helps to improve movement, balance and coordination for people with disability and aids in the development of communication and comprehension skills. Sensory activities have also been known to lower pain perception, decrease anxiety levels and encourage new stimuli and emotions for participants. Acting Chief Executive Officer of Achieve Australia, Brent Pitts says the sensory rooms provide an opportunity for their valued clients to develop a range of new skills. “The sensory systems will allow us to combine interactive learning techniques in the future to create a positive experience for each participant we support,” he says. Team Leader at Achieve Australia Rocio Claret also acknowledges the benefits of the technology. 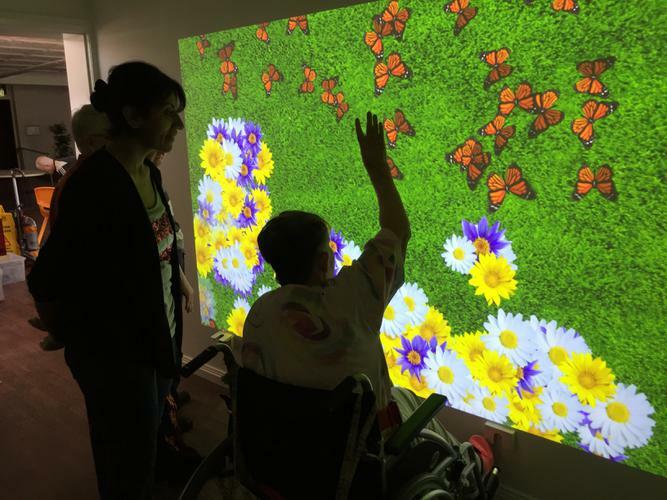 “The interactive display has provided a way to immerse our participants in a sensory experience that engages their visual and auditory senses,” she says. Robyn and Steven are clients of Achieve Australia and enjoy the experience the sensory rooms offer. “It’s nice, I enjoy playing the games on the wall,” Robyn says. “I enjoy the games, it’s fun,” Steven says. Achieve’s new sensory rooms were made possible thanks to funds raised at last year’s 17th Annual Achieve Golf Day held at the Monash Country Club. Federal Member for Bennelong, John Alexander OAM MP and Chairman of the Board, Richard Dinham attended the Golf Day, alongside 100 Achieve Australia supporters. For more information on Achieve Australia and the support they provide to people with disability click here.